No matter where we look, our world seems to be a big, tangled, interconnected mess. With everything everywhere so interconnected, how might we comprehend the complexity of our problems, and deal with the wicked messes we’ve got ourselves into? Systems thinking is a powerful way to help us look at the big pictures of complex problems. How might we draw these big pictures? 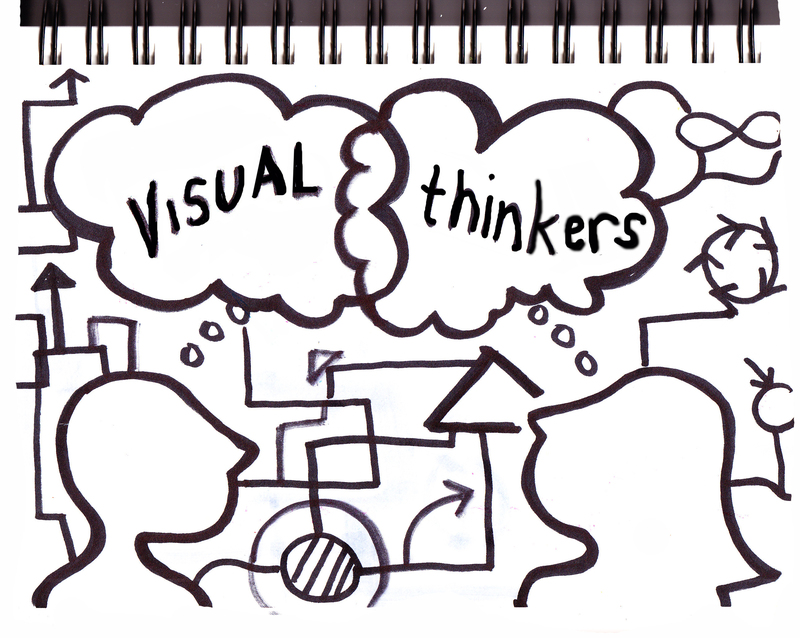 The final Visual Thinkers gathering of 2015 will be a special interactive session on visual system sketching. Drawing on well-known frameworks from system theory, the session will engage participants in learning to hand-sketch interpretive models of systemic relationships. Peter Jones and Patricia Kambitsch will share modes of sketching-to-scale based on graphic recording presentation modes. The session will develop visual modeling approaches in the context of problem areas of interest to participants. Also we will be continuing BOOK CLUB, an collaborative project whereby we share and exchange books that we make from sketchbooks. Read more about Book Club here. 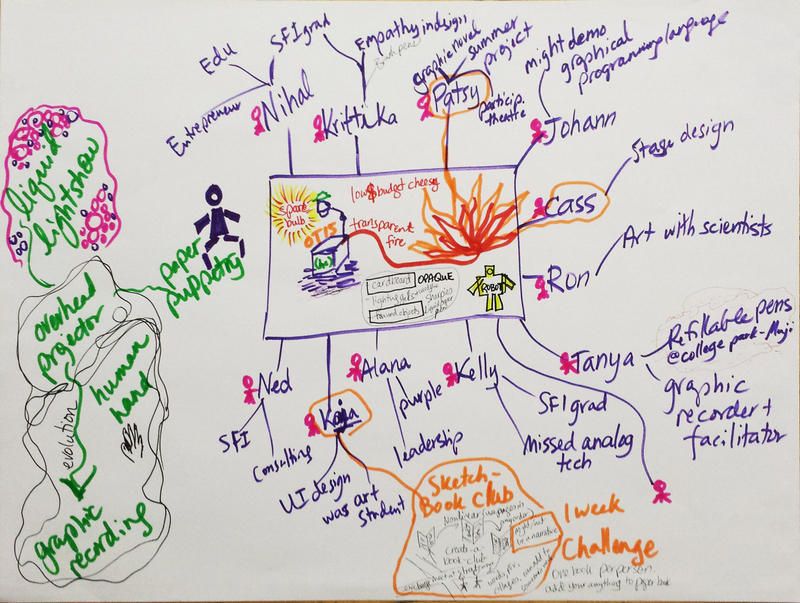 This entry was posted in Event Announcements and tagged book club, complexity, diagram, drawing, event, graphic recording, meet-up, sketching, system theory, systems thinking, Toronto, visual modelling, visual thinking on November 11, 2015 by Patricia Kambitsch. Tonight the Visual Thinkers met to start our Book Club. This is a collaborative sketchbook project that you can join in: just come to our next meet-up on November 24. Each book has a theme (magic, fear, computers, Canadians, etc.) Contributors can make a new page by drawing, painting, writing, collaging, etc. Or they can modify a previous page by someone else. As visual thinkers how might we collaborate? And when we collaborate, what might we produce? During this session of Visual Thinkers we will share in creating images and meaning by drawing and writing together. We will also launch a continuing group project we call “Book Club.” What’s Book Club? 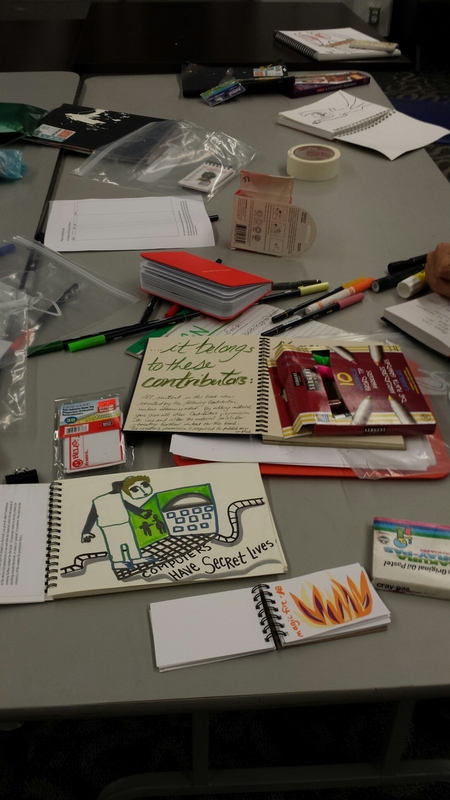 Instead of reading books, in this Book Club we will create the contents–words and visuals– in sketchbooks, then pass our sketchbooks along to others who will continue the process. How do we participate in book club? 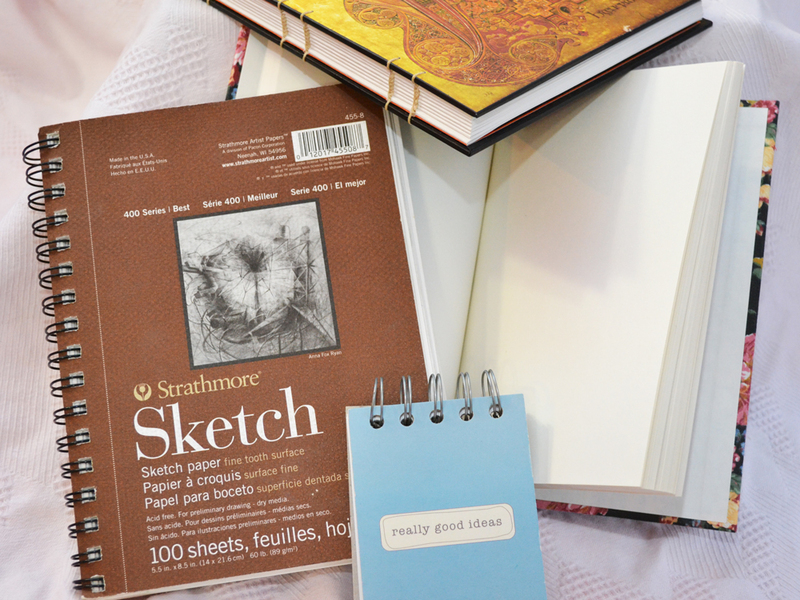 Bring a blank sketch book, your favorite drawing tools, materials for collage and ideas. What will the books be about? That’s up to you! Some of the books might be shared sketchbooks on a theme, some might contain fiction, some might be alphabet books, icons for graphic recording, infographics, comics, or maps. The content is up to you. Bring a sketchbook…or not. Participation in Book Club is of course optional, and there will be collaborative games and activities during the evening. Bring your ideas. Come ready to create. Each Visual Thinkers meeting starts with “Show and Tell”. Anyone can share an image or idea, a toy or tool, for the group to discuss for 5 minutes. (We have a laptop, projector and Internet. Bring your image on a USB stick if required.) Bring drawing materials and you can practice your live drawing skills with us. Join us on October 27, 7-9pm, at OCADU’s Lambert Lounge, 100 McCaul St., Toronto. Free to attend, and wheelchair accessible. After the meet-up we usually go for interesting food and beer at Sin & Redemption nearby. This entry was posted in Event Announcements and tagged book club, collaboration, creative writing, drawing, event, meet-up, sketchbook, sketchnotes, storytelling, Toronto, visual thinking on October 25, 2015 by Alana Boltwood. Visual Thinkers Toronto 2015-09-29 introduced these participants and ideas. Notes by Alana Boltwood. Patricia Kambitsch mixes oil and water pigments on a glass platter (designed for devilled eggs? ), lit up by Otis the overhead projector. Photo by Alana Boltwood. Old tech meets new. 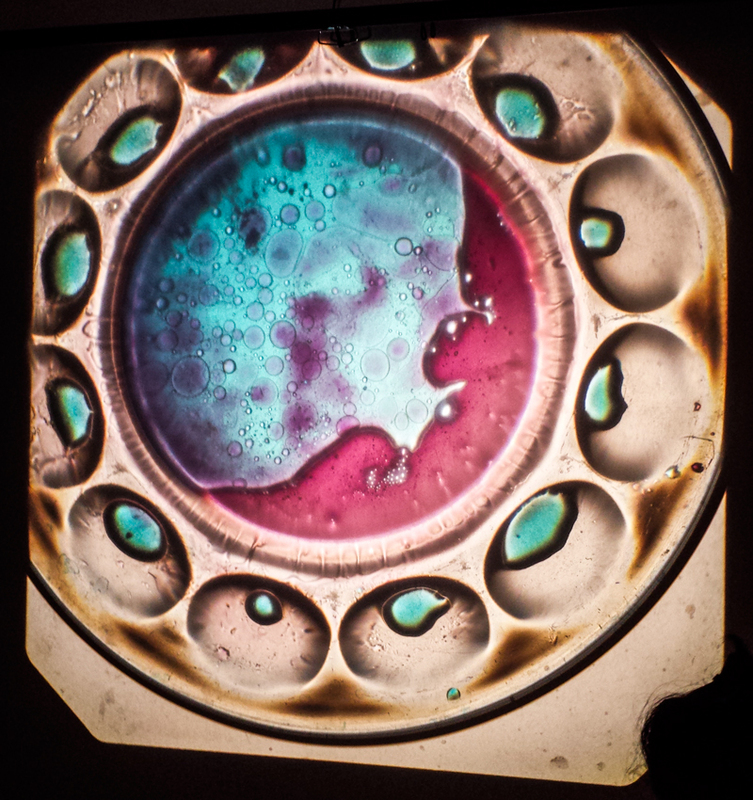 Liquid light-show by Patricia Kambitsch, on Otis the Overhead, at Visual Thinkers Toronto. Photo by Tanya Gerber. 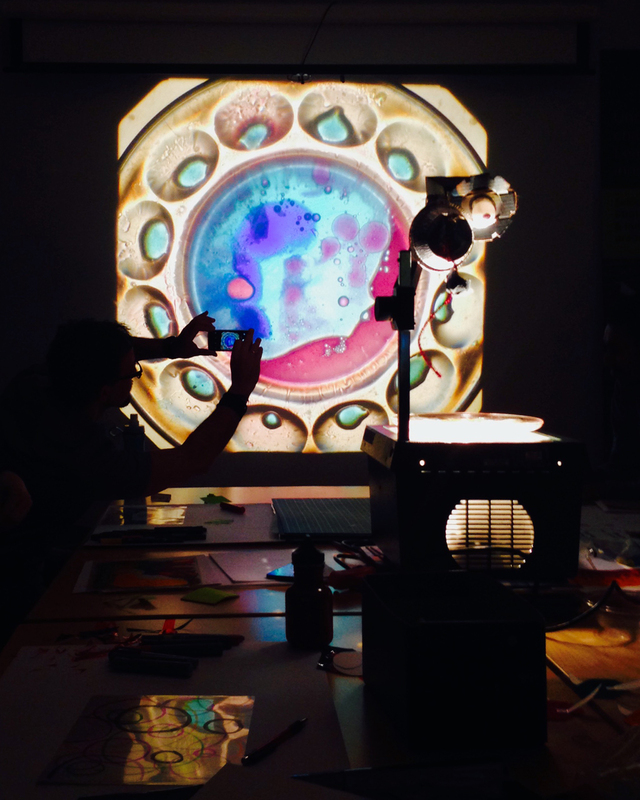 This entry was posted in Event Reports and tagged analog, analogue, art, event, graphic recording, liquid lightshow, meet-up, overhead projector, overhead transparency, storytelling, Toronto on October 25, 2015 by Alana Boltwood.